PLEASE NOTE: This clipper is supplied by the Manufacturer WITHOUT A BLADE. Comment: Needs a track record before we comment. PROS: With the past history of Oster small animal machine it should be good. Certainly a more modern appearance!. CONS: Made in China! 15 watts sounds low! No blade! . 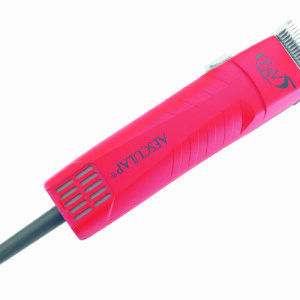 Oster small animal clippers have for many been synonymous with the clipping of dogs. However both time and strong competition have eroded a market that was once exclusively “Oster.” Since the days of the single and two speed A5 clippers the new Oster models that have emerged have proved disappointing. The new Power Max” is made in China. Hopefully a wise decision? There are a few aspects we would question! Described as “powerful, time saving and lightweight clippers” it is also claimed to be 20% lighter than the Oster A5! Assuming the Oster A5 is the same as they supply the UK market, then according to our electronic scales the weight is 0.5kilos with the blade fitted which happens to be exactly the same weight we recorded for the Oster A5. 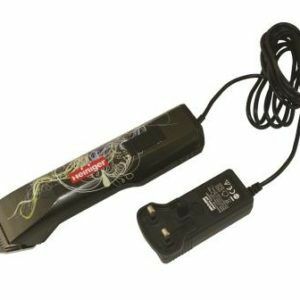 Comparing it to other compatible makes (admittedly all 35w dog clippers) physiologically our opinion was it felt heaver! Oster literature claims the clipper has a powerful (yet silent) cool running motor. In all the years we have tested clippers and trimmers (of all sizes) we have never come across a “silent” motor! The “Power Max” is not to our mind “silent” and the production model we tested with a blade fitted scored our “2” rating – on a par with other similar machines of its type as far as noise levels where concerned. A curious comment in the manual under “Important Safeguards” states “The intended operating time is 20 minutes!” (See manual heading -WARNINGS No:16) Quiet what is meant by that is uncertain but the reference “20 minutes” might be considered rather “restrictive!” Lastly Oster say this is the “New Kid on the Block!” and capable of pretty robust work in a fully professional arena. Indeed this may well be so, the passing of time will determine. On the plus side the design and overall finish is good with a “satin” type finish to the upper portion of the upper casing, at the rear of which is the on/off speed selection switch. This casing is set into a rubberised upper casing secured with four screws to the lower casing moulded in the same rubberised material. One of the features of this rubberised body casing covering is that it provides excellent “grip” especially when working in warm conditions. The “bail” arm (hanging hook) is rigid – a nice design feature! The blade release mechanism follows the tradition method. The blade drive lever has been re-designed and is a robust plastic component of which two spares are supplied at the time of purchase – suggesting they may wear and need to be periodically renewed. This clipper also takes blades from the AESCULAP/ANDIS/LAUBE/MOSER//WAHL detachable A5 type blade ranges.